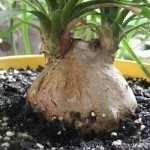 Can you cut back a ponytail palm? I have a ponytail palm that a friend gave me several years ago. It is now 8' tall and brushing against the ceiling. Can they be cut back? And if so, will they grow leaves again? Or branch? I always put it outside during the summer, but I don't think I'm going to do that anymore. I'm 69 years old and as tall and as heavy as this plant is, it's getting difficult to move it.